The purpose of this book is to determine what the political problems have been in establishing security communities in Southern Africa. Its objectives are three-dimensional: empirical, practical and theoretical. It then examines how best these problems can be understood within the framework of the security community paradigm. The book covers the pre-Front Line States (FLS) to the Organ for Politics, Defence and Security (OPDS) era. For the completeness of the coverage of the region's security structure development, the book looks at issues from the era of Prime Minister Malan's 'African Charter' through to the Southern African Development and Coordinating Conference (SADCC) up until 2003. In the coverage of the more contemporary period, the book takes cognisance of the prevailing political challenges faced by some countries in the Southern African Development Community (SADC) region and the impact this has on the regional grouping as it aspires to improve its performance on the democratic scale. 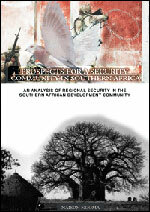 The insights into security in Southern Africa are informed by experience and research and begins to fill a gap in the literature as the editors who introduced the notion of regional 'security community' in the post-bipolar period, Adler & Barnett, failed to include an African case study in their volume. The book contributes to the African as well as other voices to the post-9/11 'new' security/collective security debate and thus talks to concerns of the New Partnership for Africa's Development (NEPAD) and the early-2005 Report of the Commission for Africa "Our Common Interest". The book overviews alternative approaches to the understanding of the region. To order this book, contact the ISS Publications Co-ordinator, Ms Mpume NYANDU on Tel: +27 12 346 9500 Fax: +27 12 460 0998 Email: mpume@iss.org.za. Credit card payments are accepted. Price excludes postage and packaging.